Background and History When did all this happen? 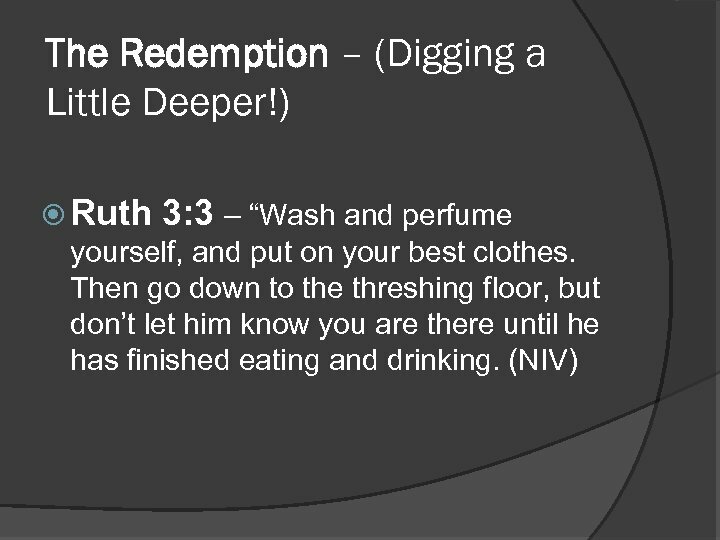 In our Bibles Ruth is a separate book. 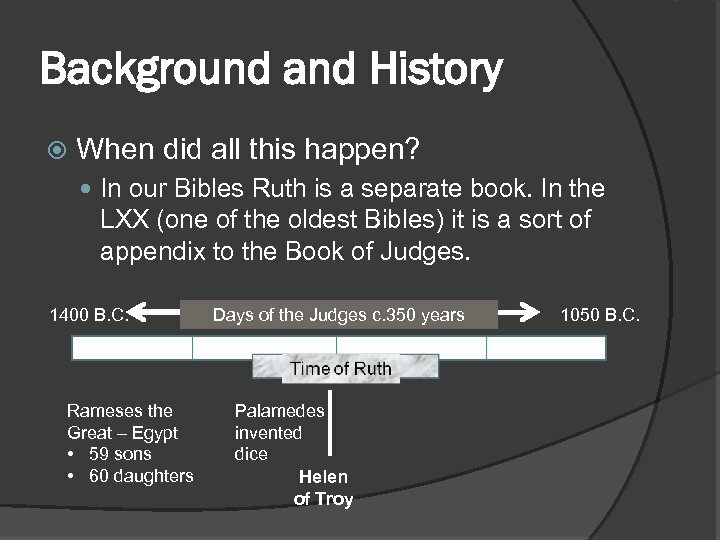 In the LXX (one of the oldest Bibles) it is a sort of appendix to the Book of Judges. 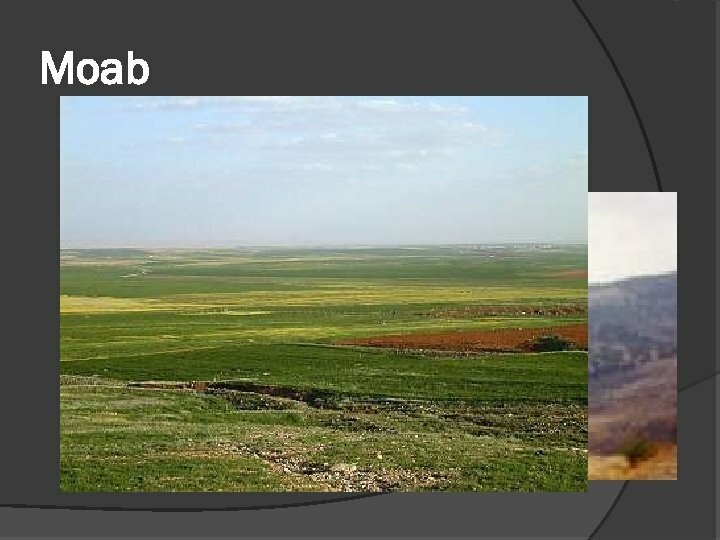 1400 B. C. Rameses the Great – Egypt • 59 sons • 60 daughters Days of the Judges c. 350 years Palamedes invented dice Helen of Troy 1050 B. C.
Moab Started with Lot and his daughters (Gen. 19: 36, 37. 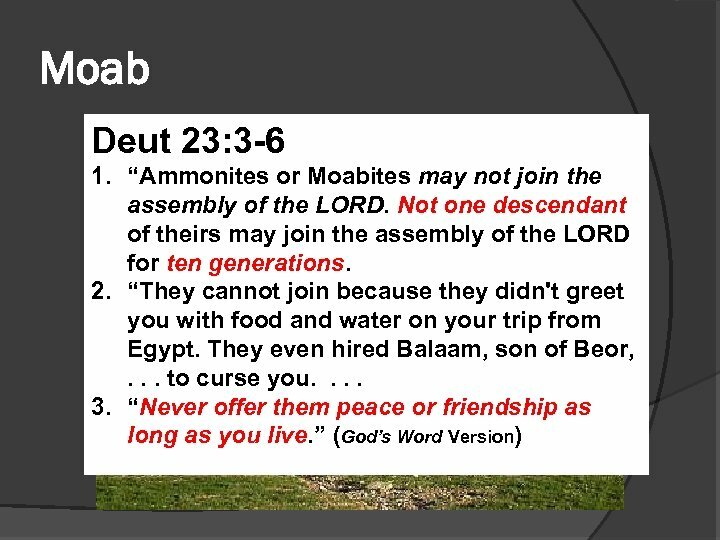 Kinship with the Israelites. 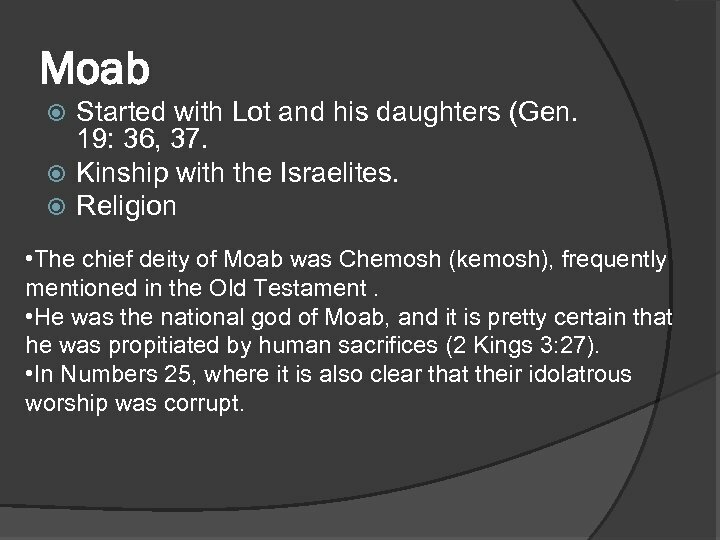 Religion • The chief deity of Moab was Chemosh (kemosh), frequently mentioned in the Old Testament. 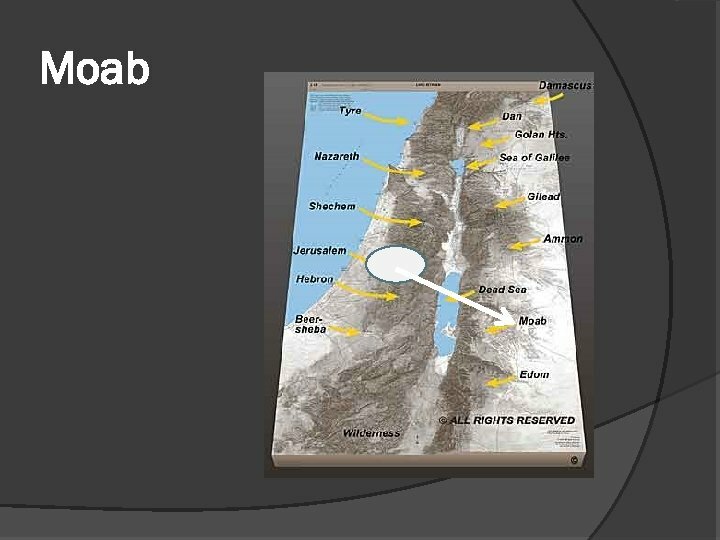 • He was the national god of Moab, and it is pretty certain that he was propitiated by human sacrifices (2 Kings 3: 27). 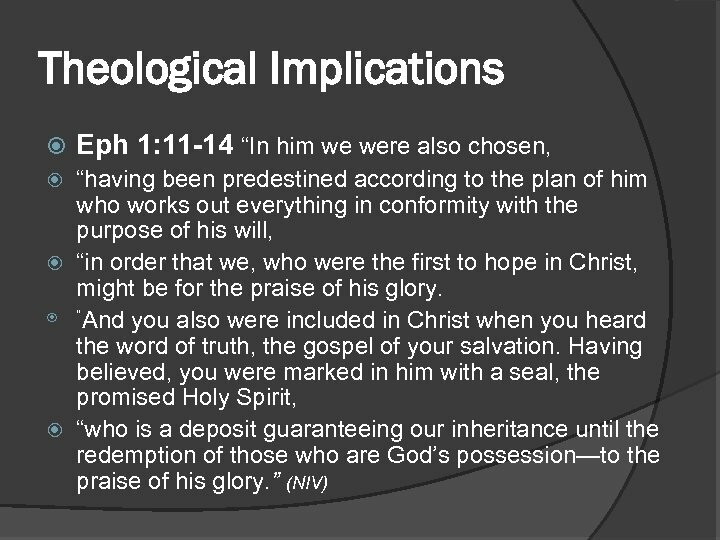 • In Numbers 25, where it is also clear that their idolatrous worship was corrupt. 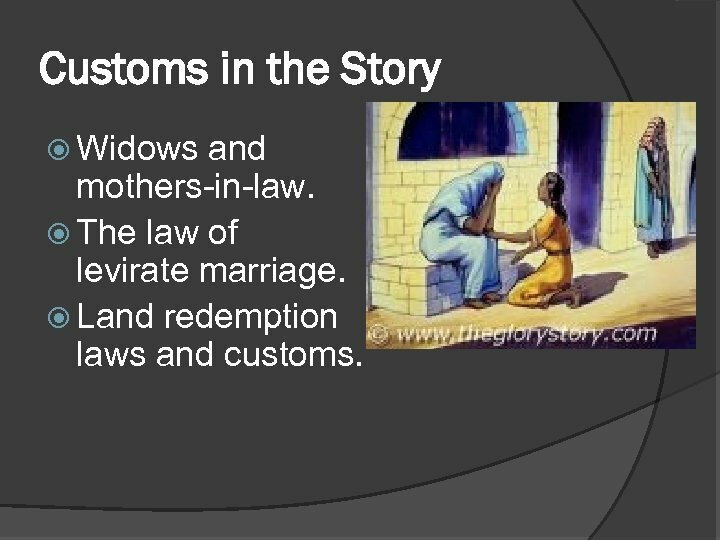 Customs in the Story Widows and mothers-in-law. 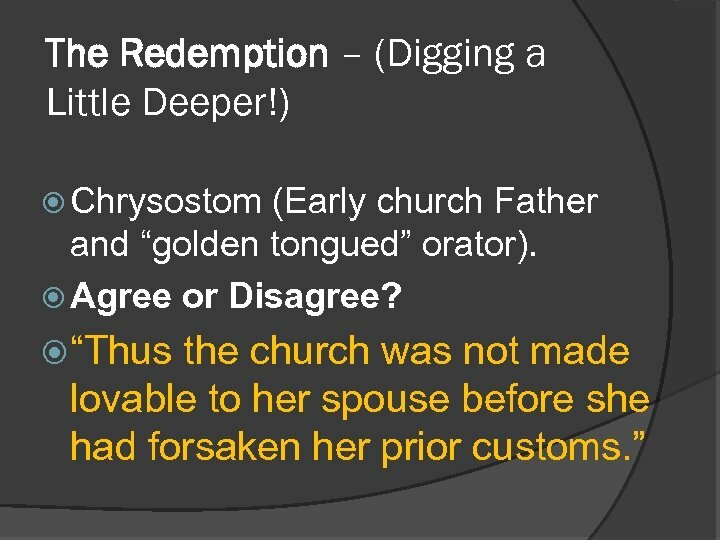 The law of levirate marriage. 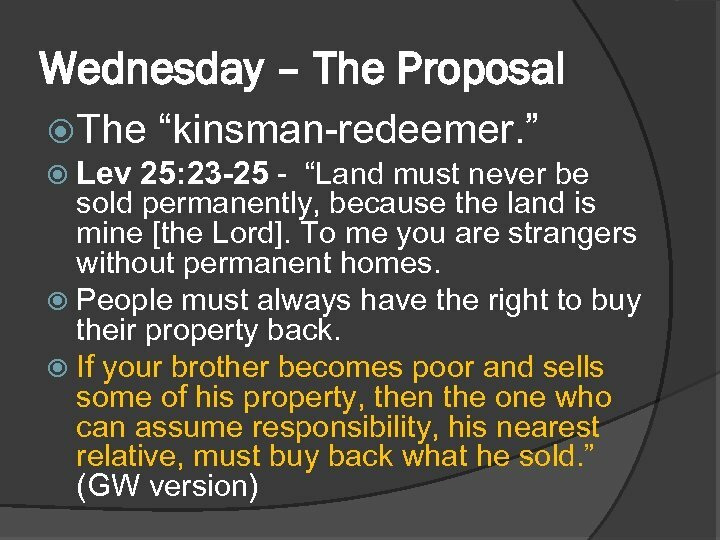 Land redemption laws and customs. 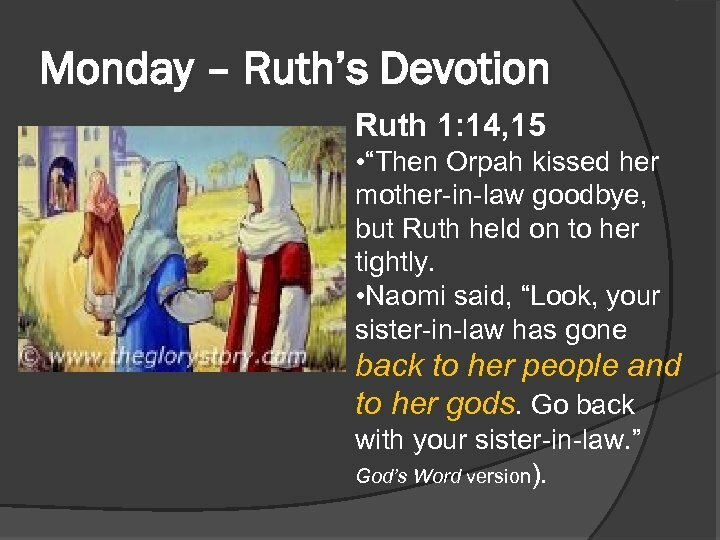 Monday – Ruth’s Devotion Ruth 1: 14, 15 • “Then Orpah kissed her mother-in-law goodbye, but Ruth held on to her tightly. 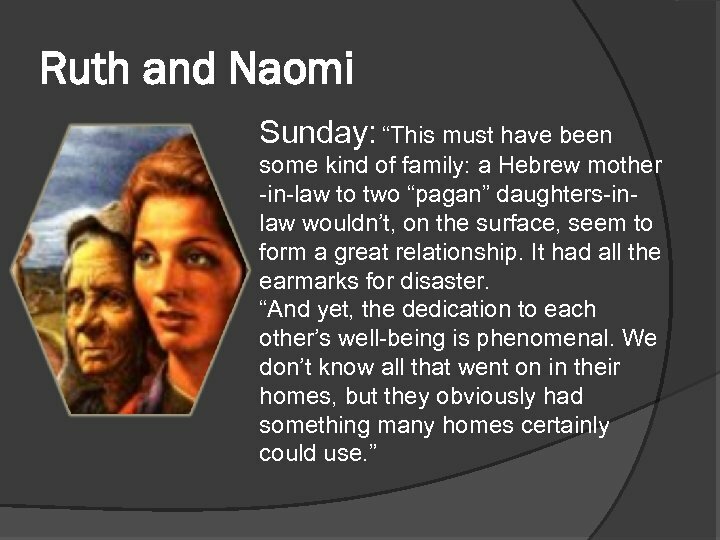 • Naomi said, “Look, your sister-in-law has gone back to her people and to her gods. Go back with your sister-in-law. 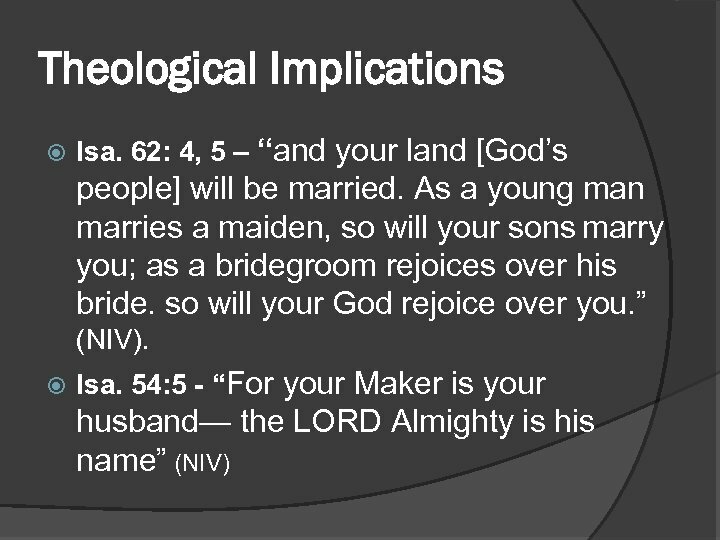 ” God’s Word version). 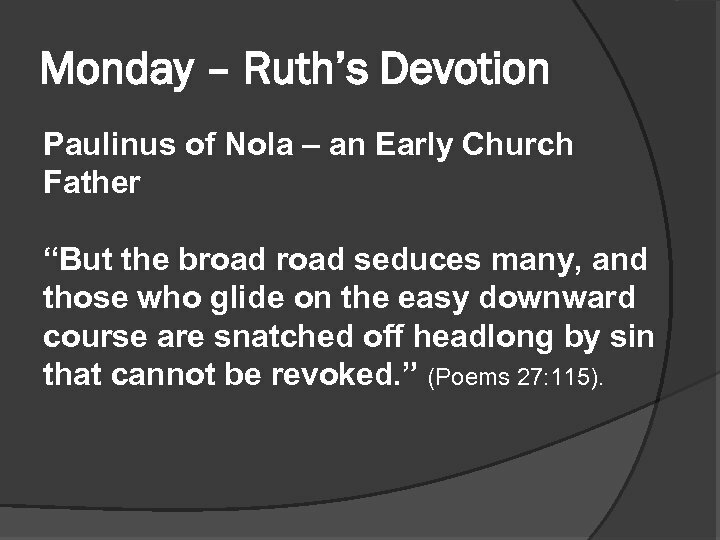 Monday – Ruth’s Devotion Paulinus of Nola – an Early Church Father “But the broad seduces many, and those who glide on the easy downward course are snatched off headlong by sin that cannot be revoked. ” (Poems 27: 115). 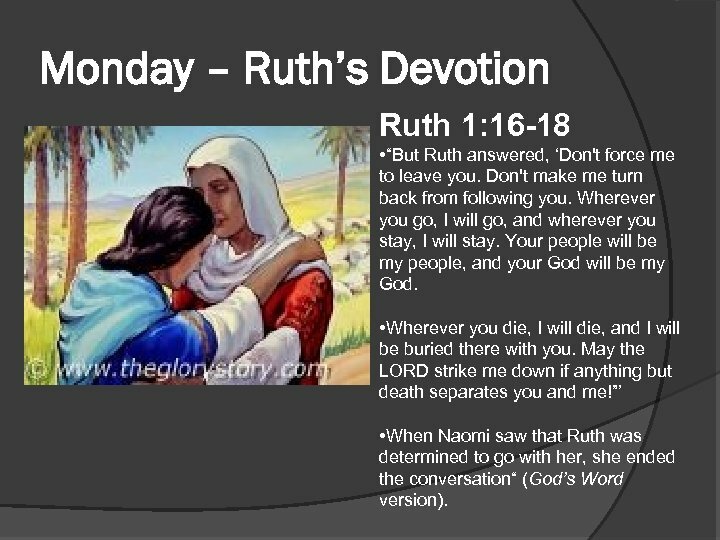 Monday – Ruth’s Devotion Ruth 1: 16 -18 • “But Ruth answered, ‘Don't force me to leave you. Don't make me turn back from following you. Wherever you go, I will go, and wherever you stay, I will stay. 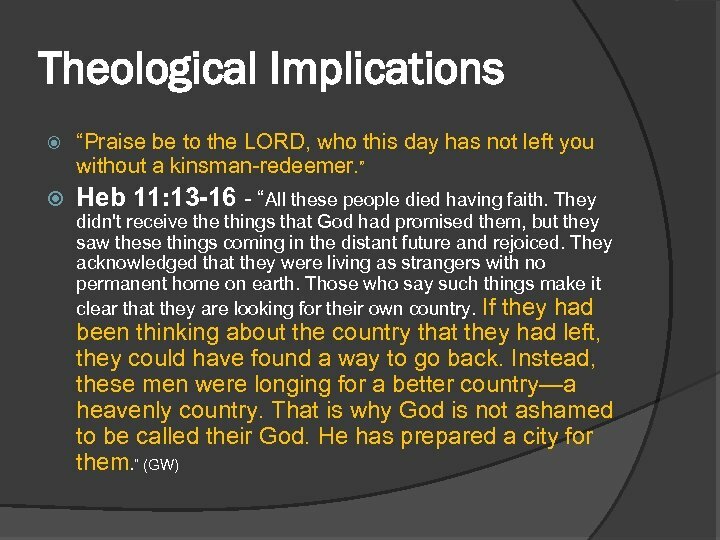 Your people will be my people, and your God will be my God. • Wherever you die, I will die, and I will be buried there with you. 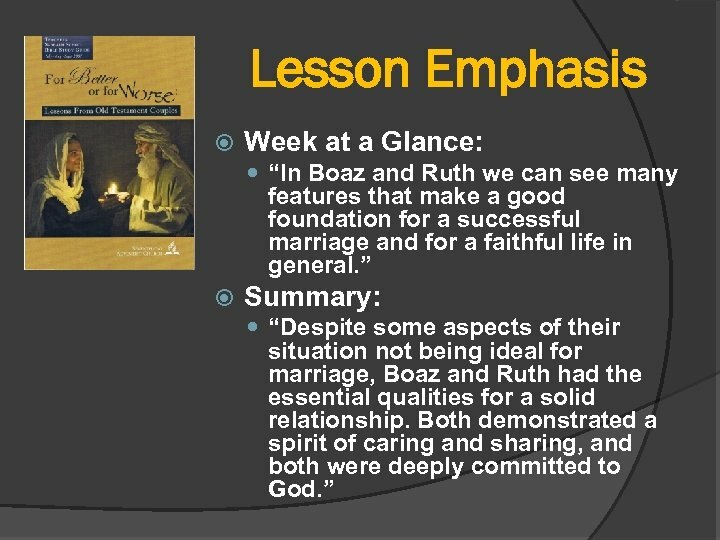 May the LORD strike me down if anything but death separates you and me!”’ • When Naomi saw that Ruth was determined to go with her, she ended the conversation“ (God’s Word version). 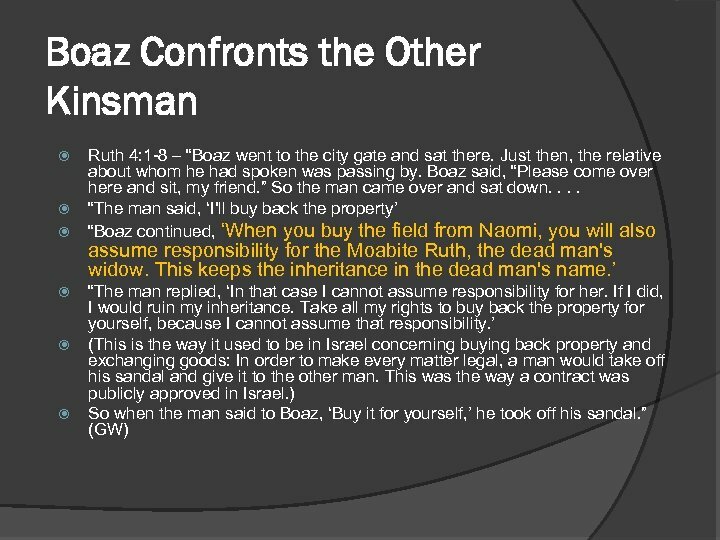 What Did Boaz Know? 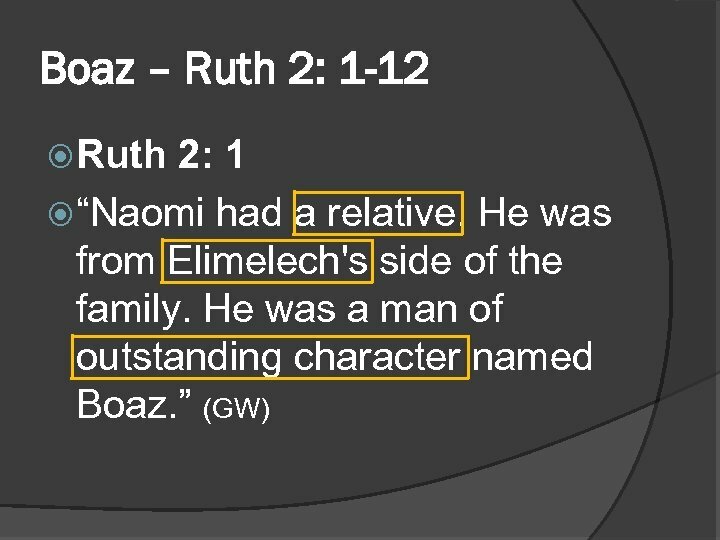 Ruth 2: 11, 12 “People have told me about everything you have done for your mother-in-law after your husband died. They told me how you left your father and mother and the country where you were born. They also told me how you came to people that you didn't know before. 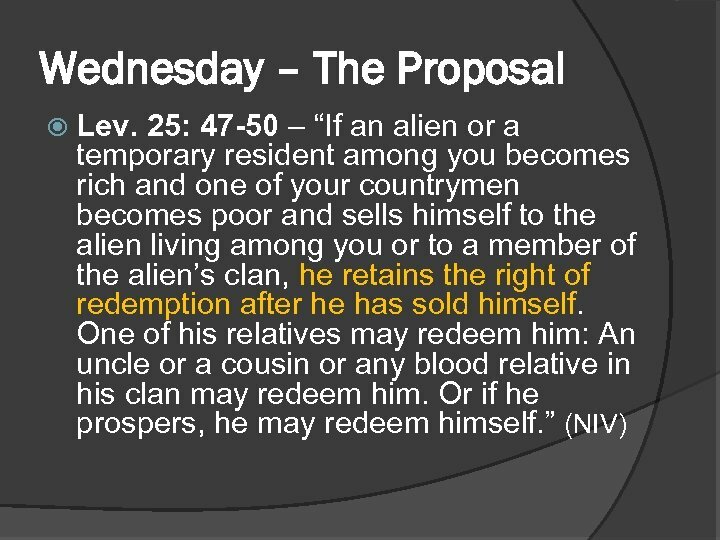 Deut. 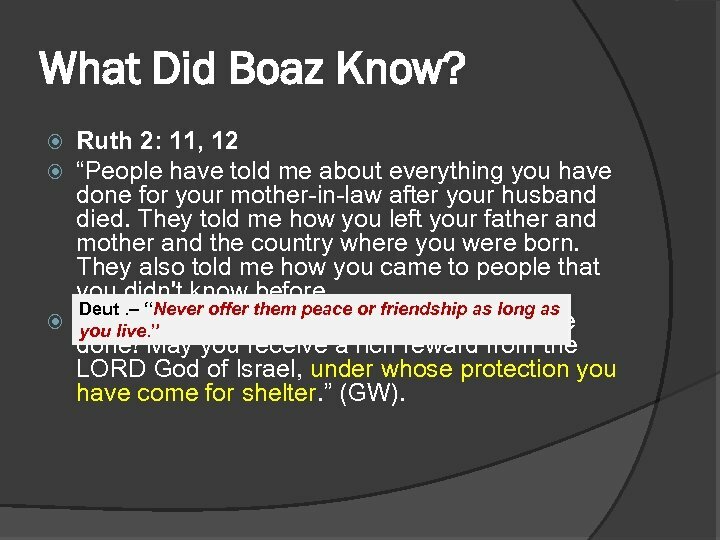 – “Never offer them peace or friendship as long as May the LORD reward you for what you have you live. ” done! 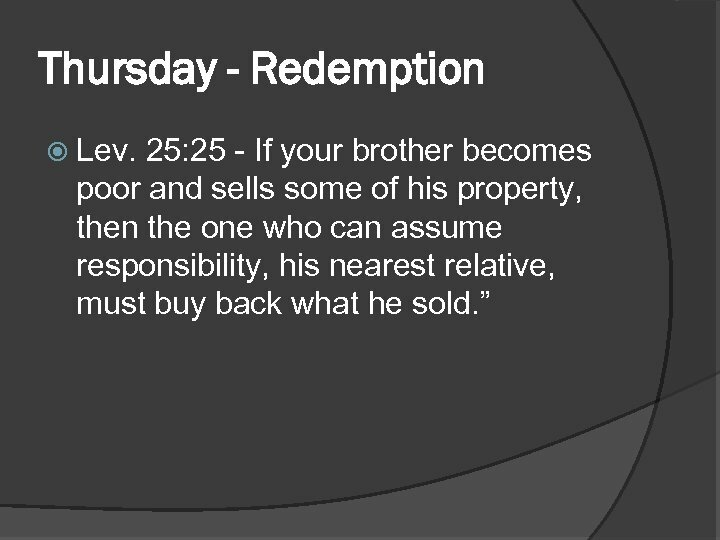 May you receive a rich reward from the LORD God of Israel, under whose protection you have come for shelter. ” (GW). 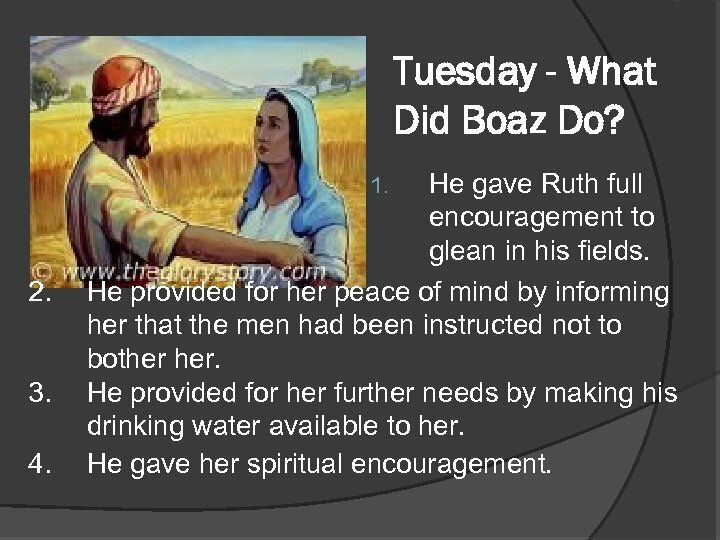 Tuesday - What Did Boaz Do? 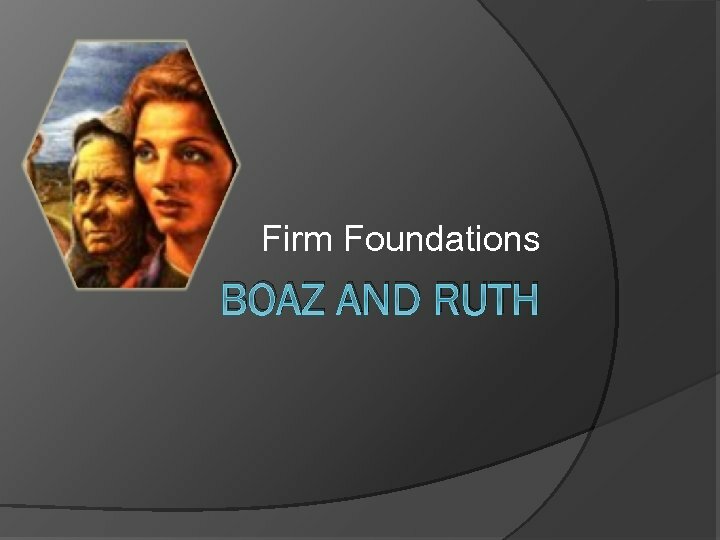 He gave Ruth full encouragement to glean in his fields. He provided for her peace of mind by informing her that the men had been instructed not to bother her. He provided for her further needs by making his drinking water available to her. He gave her spiritual encouragement. 1. 2. 3. 4. 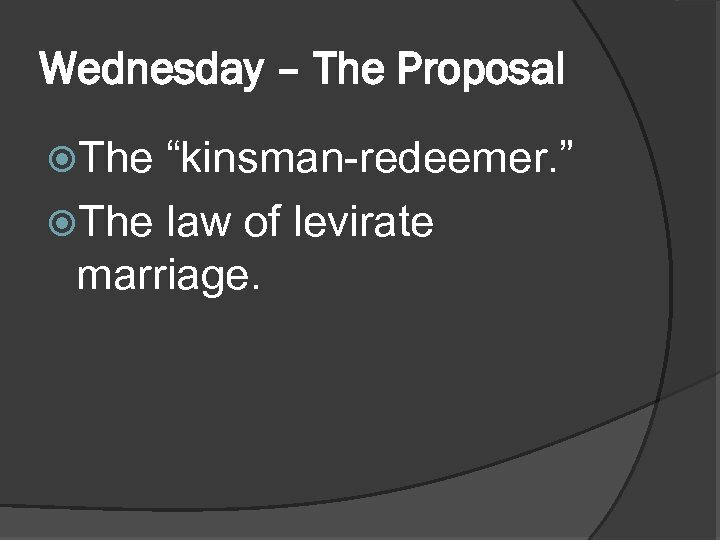 Wednesday – The Proposal The “kinsman-redeemer. 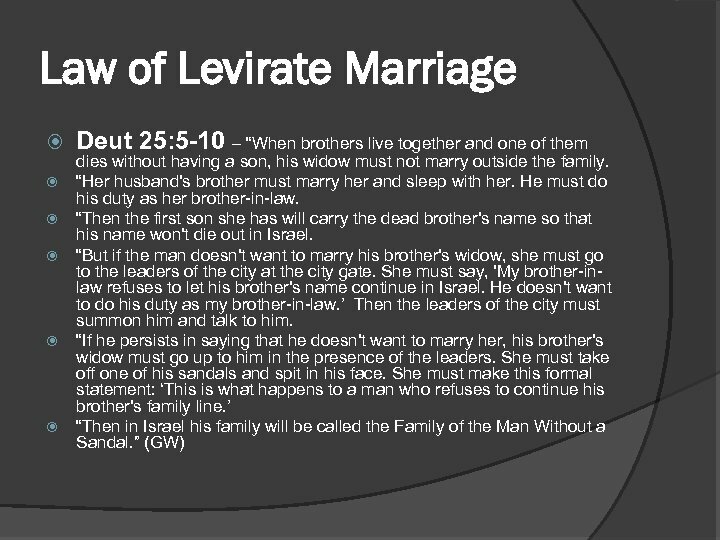 ” The law of levirate marriage. 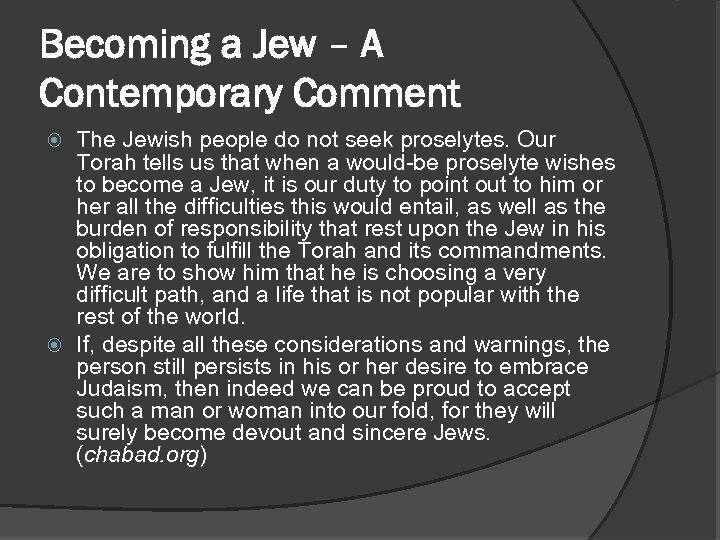 Theological Implications Jer. 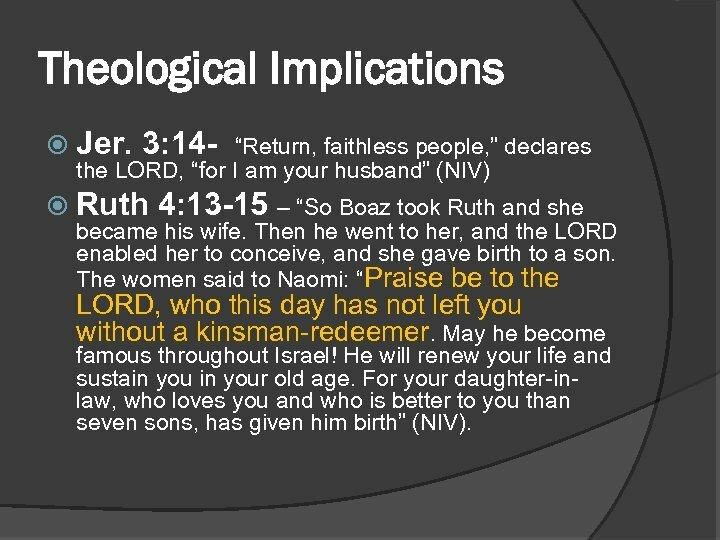 3: 14 - “Return, faithless people, ” declares the LORD, “for I am your husband” (NIV) Ruth 4: 13 -15 – “So Boaz took Ruth and she became his wife. 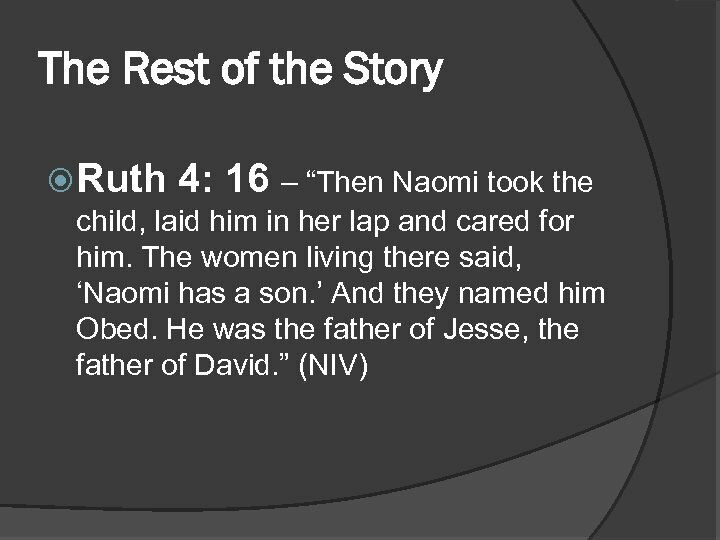 Then he went to her, and the LORD enabled her to conceive, and she gave birth to a son. 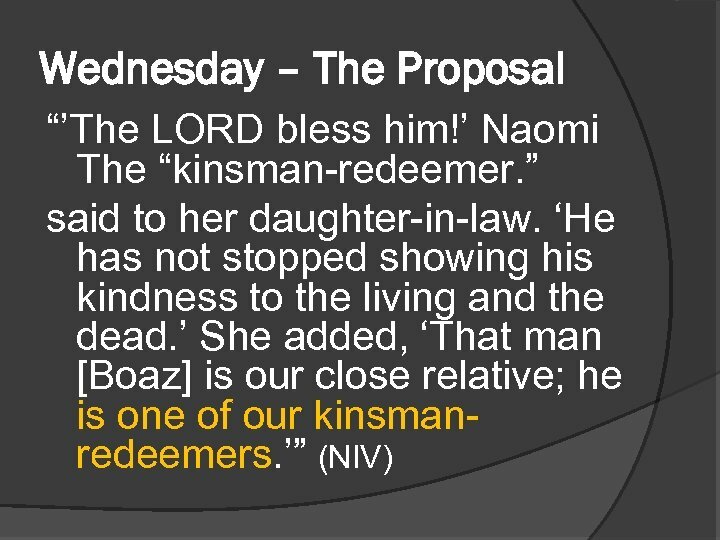 The women said to Naomi: “Praise be to the LORD, who this day has not left you without a kinsman-redeemer. May he become famous throughout Israel! He will renew your life and sustain your old age. 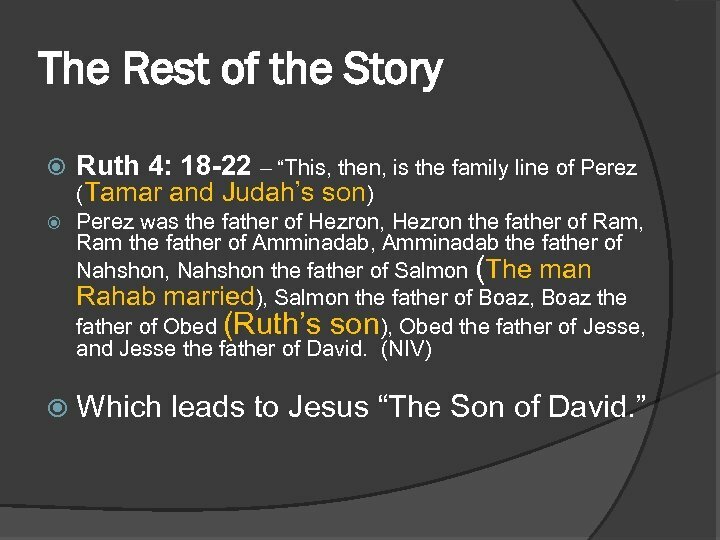 For your daughter-inlaw, who loves you and who is better to you than seven sons, has given him birth” (NIV). 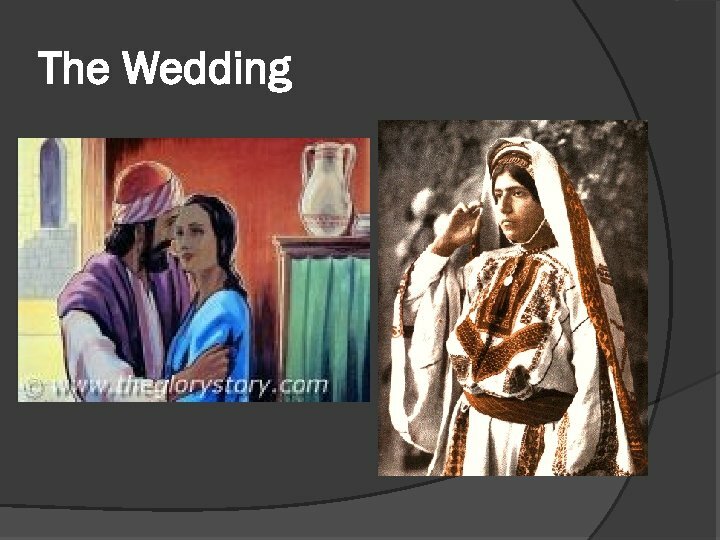 Law of Levirate Marriage The most famous Bible story about this law is in Genesis 38 – the story of Tamar and Judah. 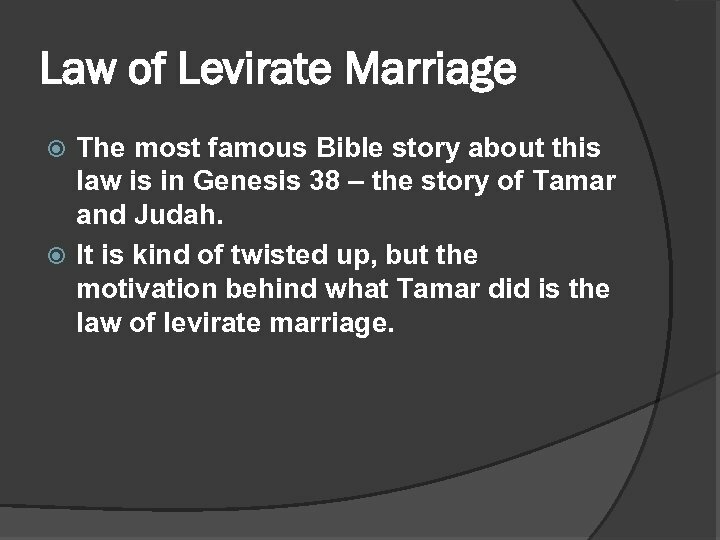 It is kind of twisted up, but the motivation behind what Tamar did is the law of levirate marriage. 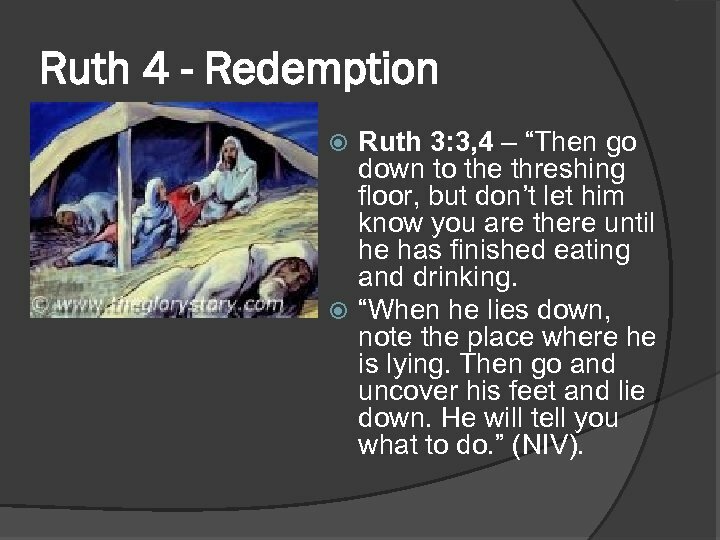 Ruth 4 - Redemption Ruth 3: 3, 4 – “Then go down to the threshing floor, but don’t let him know you are there until he has finished eating and drinking. “When he lies down, note the place where he is lying. Then go and uncover his feet and lie down. He will tell you what to do. 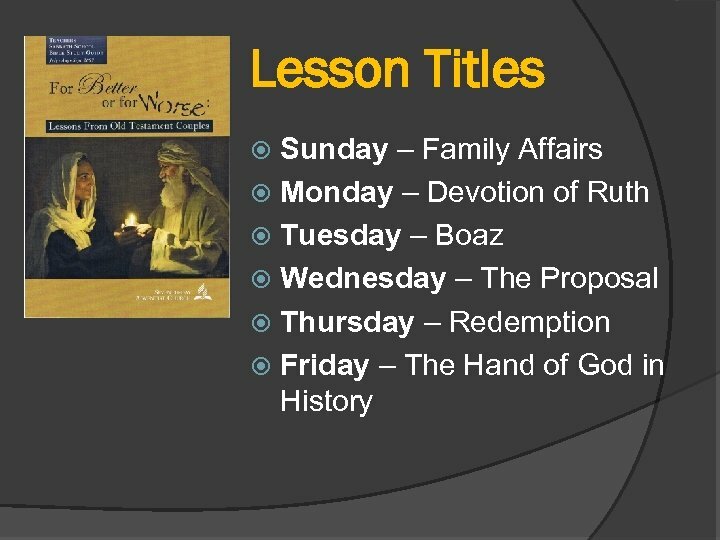 ” (NIV). 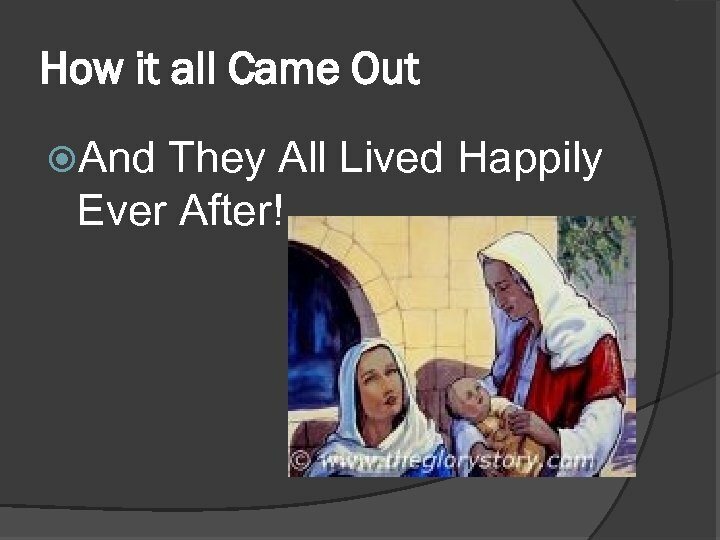 How it all Came Out And They All Lived Happily Ever After!